Man, I've been procrastinating on blog posts again. Since my last post I've been to a D-Backs autograph event, Fan Fest, and a spring training practice. I guess those are three pretty good excuses for not blogging. 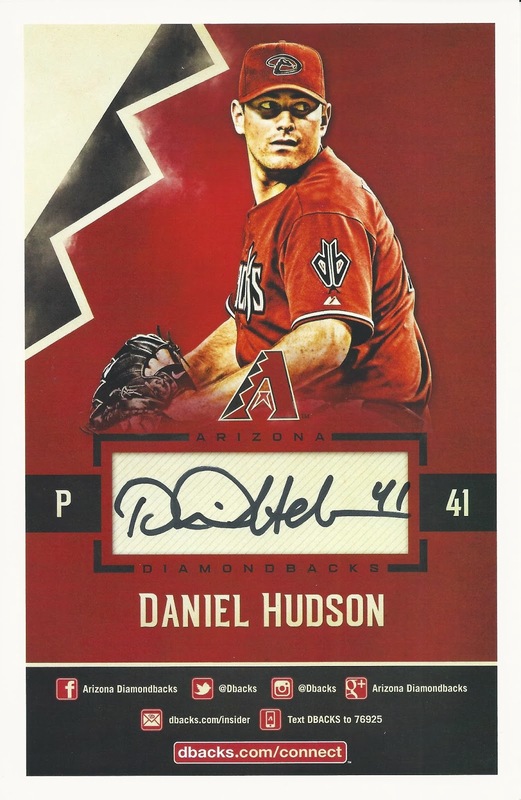 The day before Fan Fest, I met up with Daniel from It's Like Having My Own Card Shop to get a few autographs. You can check out what he got here. We had a good time. The next morning was D-Backs Fan Fest. It was also the preregistration sale for San Diego Comic Con badges. I chose to try my luck at SDCC badges instead of getting to Fan Fest early. I failed miserably. We got down to Chase Field later than I would have liked. The day wasn't lost because I was able to score autograph tickets for the afternoon autograph sessions during the online sale which took place on Friday. My son and I got autographs from Miguel Montero, Addison Reed, Randall Delgado, and Alan Trammell at the regular autograph tables. We also hit up the alumni signing at the Game Seven Grill and got Brandon Webb, Shea Hillenbrand, and Augie Ojeda to sign a few cards. Afterward we checked out the last session for the kids' tables. We got Brad Ziegler, Dave McKay, and Daniel Hudson. There was no line for Huddy so I was able to talk to him for a minute. He gave me an extra Fan Fest 5x7 plus the one for my son. Thanks, Daniel! They set a record for attendance so the lines for the games and other kids stuff were extremely long. We didn't get to do quite as much as we would have liked but that's okay. All in all it was a great time. Good stuff! Glad you got to meet with Hudson! That is a sweet postcard! The Royals used to give black and white ones out for people that had nothing to get signed (they never looked that good, though). But, now give out generic baseball-themed ones with a Royals logo and no pictures. I'm a little jealous. That's a pretty neat looking postcard. As far as lower half design, I have a similar looking custom card, but I really like the upper left corner. I wish the Cubs had something similar to use like that.